Walking into the lobby, you’ll be greeted by a member of our friendly staff, happy to point you in the direction of your room after your journey. Feel free to drop your bags, stretch your legs, and relax in our newly remodeled Lounge area. We’d love to share a hot cup of cocoa, tea or coffee, and tell you a little bit about Grants Pass, and what makes us so special. If you time your arrival just right, we may be hosting an evening wine tasting. At the Redwood Hyperion Suites, it’s our mission to make you feel right at home, from the second you walk through our doors. Once you’ve had some time to unwind, and release the tensions of the road, we’d love it if you’d take a moment to explore the grounds and see firsthand what sets us apart. 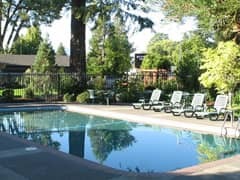 It’s true that there are many places to stay in Grants Pass, but what makes us truly special is our attention to detail, and our drive to make your stay a memorable one, for all the right reasons. Redwood Hyperion Suites is more than just a place to recharge and get a good night’s rest on your trip; it’s an experience all its own. We’ve taken care to incorporate the beauty of Southern Oregon into every square inch of the motel grounds. Our lovely gardens offer more than a pleasant view and path on which to stroll. Try a picnic in the children’s play area, or take a romp with Fido in our dedicated pet area. Take a stroll and truly experience nature, right outside your door. Our pool area is one of Grant’s Pass best kept secrets. Where else can you swim at twilight, beneath towering redwoods, illuminated by the stars? We’ve created such a relaxing haven that we often find our guests braving the temperatures, long after swimsuit season has left us. At the Redwood Hyperion Suites, you’ll never feel like we’re “just another motel”. We’ve taken the same care to match the beauty of our surroundings with the comfort of our rooms. Whether its business or pleasure, a romantic getaway, or a family reunion, we think you’ll find the perfect suite to suit your experience. So, unpack your bags, throw on that bathing suit, and grab that novel you’ve been dying to read…or just stretch out and relax with us, under the Redwoods. Hyperion is the name given to a Coast Redwood (Sequoia sempervirens) located in Northern California. The Hyperion ranks as the world’s tallest known living tree. It was discovered on August 25, 2006 by naturalists Chris Atkins and Michael Taylor and was verified as standing 379.1 feet (115.55 meters) tall by Stephen Sillett. It is claimed to contain 18,600 cubic feet of wood and estimated to be 700 to 800 years old.